Concert reviewers can find only the highest praise for the award-winning formation whose playing has been compared to an elegantly cut Armani suit. 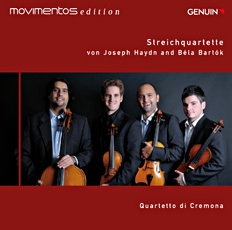 The acclaimed Quartetto di Cremona has just released its first Genuin CD as part of the Movimentos series. Elegance is not the only quality for which Quartetto di Cremona’s performances are known: From the very first notes, the quartet’s direct, sincere and artistic approach to the works of Haydn and Bartok—a coupling which could not have been more appealing as it highlights the string quartet canon over the centuries—reminiscences and forebodings... Listeners will experience how this music still speaks to us today after delighting the nobility in powdered wigs two centuries before. A noteworthy achievement! „Listen and ponder. These are committed performances throughout ... "
"Both Op 54 No 2 and Op 77 No 1 are remarkable as much for the profundity of their slow music as for the vitality and harmonic daring of their fast movements and in both Quartetto di Cremona combines keen attack with a wealth of feeling (just sample their breathtaking pianissimo at 2'51'' into the Adagio of Op 77 No 1). As to their Bartok, the muted Prestissimo second movement is extremely deft and exciting, the finale bold, raw and relentless." Read the review in the Gramophone Awards Issue 2010! "La brillantezza, il virtuosismo vengono temperati da un approccio più riflessivo e concentrato che se toglio un po di freschezza a queste pagine comunque interessanti." Read the italian review in the magazine Musica, issue February 2011.